One of the biggest questions regarding Superman over the years has been how do you make such a powerful, indestructible, seemingly perfect hero interesting. Well, the creators of CBS's 'Supergirl' have found a way to approach that topic with his cousin, Kara, by exploring her time on Krypton (something that's not possible with Kal-El), wrangling her ego and realizing she needs more than her brute strength to be an effective superhero. While the Kryptonite-infused sparring session with Alex was a great ego-check for Kara, who inadvertently caused an ecological disaster while trying to steer clear a tanker from a fire in the opening, it reminds us Supergirl is still a hero in training. Episode two, 'Stronger Together,' builds on the excellent but crammed pilot with some more character development for Kara, the endlessly charming Melissa Benoist, James (Mehcad Brooks), and Cat (Calista Flockhart). The episode packed a more emotional punch because it examines the sense of loss of her home world, the dubious intentions of her mom's evil twin General Astra (Laura Benanti), and poignantly reunites Kara with her mother via hologram in a makeshift Fortress of Solitude within the DEO that can answer her questions but can't deliver the hug she desires so much. The flashbacks help inform the present when a hellgrammite, an insect-like race that can conceal itself as other species, is on the loose and on the DEO's radar. It's a more immersive experience we get to share with Kara than we did with Superman because didn't grow up on Krypton. There's also some dynamic parallels with the mentors in Kara's life. Her highly skilled sister and her ambitious boss both impart some wisdom on her that emphasize paying your dues. Kara's overconfidence and reliance on her superior strength makes her vulnerable in other ways. Cat describes her rise to the top by being Perry White's assistance and working harder than her male counterparts out of necessity. If you wondered why feminism is important these are just two examples that will influence the growth of one woman, albeit a super-powered one. The second episode offered a lot of positives. Bucking a trend that Berlanti shows tend to have as far as the slow reveal of the big bad on the show, General Astra makes her presence felt almost immediately. Surprisingly, the two go toe-to-toe and while Kara is still a novice her fighting spirit is inspiring even to her evil aunt. Thankfully, Hank Henshaw steps in with a kryptonite knife that hurts and befuddles Astra. We'll have to wait to find out as to why Alura imprisoned Astra at Fort Rozz to begin with. Teamwork becomes a theme as Kara learns to appreciate her own Team Supergirl as Winn and James learn they're both in on the secret. It's funny that they address the whole glasses as a disguise for a superhero but James' line that Cat won't recognize her because she can't her now speaks to more than just appearance. And as suave and put-together as James is there's a layer of his character that's peeled back a little. Cat puts the pressure on James to get her an interview with Supergirl and he begins to doubt his worth outside of his relationships to heroes from Krypton. This leads to one of the best scenes so far on the show when it's Kara building him back up instead of the other way around for once. “Part of being your own man is knowing when to accept help,” she tells him and it speaks volumes to this team effort that she's trying to foster. She's not interested in doing it alone like her cousin. The second episode wasn't without some glitches. Astra feels a little one-dimensional as the villain so far, Cat showed a little more depth but not a lot, some of the dialogue sounded like blatant exposition, and I'm still looking for some light-hearted banter between Kara and Alex. It might be nit-picking but with a show this good and well-intentioned it doesn't detract from all the positives. On the bright side, there was a Perd Hapley (Jay Jackson) sighting who found his way from Pawnee to National City. Oh, and what's up with Hank Henshaw's glowing red eyes? I'm sure it's nothing. We also got a glimpse of Maxwell Lord (Peter Facinelli) who wasn't too fond of Supergirl's heroics. 'Supergirl' is still evolving before our eyes and like the titular character it's finding its legs. Benoist's performance helps make the show a joy to watch and you can't help but root for her. The added development with James and Cat helps to flesh out the supporting cast some more. 'Supergirl' has a lot on its mind and a lot of moving parts but remains a fun action-packed hour full of heart. 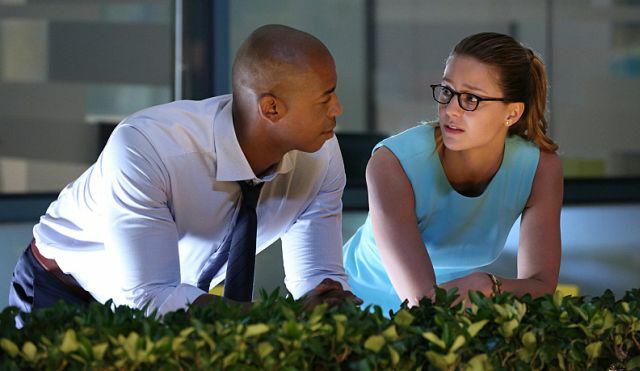 Supergirl 1x03 "Fight or Flight" - Supergirl’s powers are tested when Reactron, one of Superman’s formidable enemies, arrives in National City and targets the young hero. Also, Cat plans to run an exposé on Supergirl, on SUPERGIRL, Monday, November 9th on CBS Peter Facinelli guest stars as tech entrepreneur Maxwell Lord.